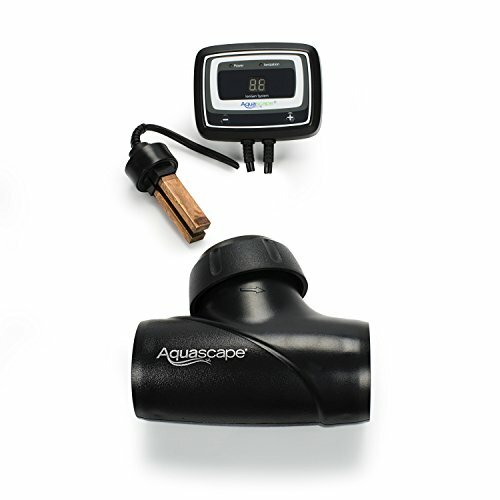 Aquascape IonGen System G2 Electronic Algae Controller for Pond, Garden, and Waterfall Features | 95027 | Fountain City Art Ctr. The second-generation Aquascape IonGen System electronic water clarifier for ponds, pondless waterfalls and other decorative water features drastically reduces maintenance and provides crystal clear water without the use of chemicals. A microprocessor inside the IonGen releases ions from a scientifically blended and tested probe that achieves maximum treatment results in water features. The outdoor weatherproof IonGen Control Panel sends signals that slowly dissolve the replaceable probe (model 95028). The ions produced by the probe treat the water and reduce string algae, as well as drastically reduce maintenance and the need for liquid pond chemicals. Simple to install, it's compatible with water containing fish and plants and is energy efficient (with less than $1 a month in electricity cost). The IonGen System G2 treats containerized ponds up to 25,000 gallons and the probe typically lasts 1 to 3 seasons (depending on the ionization level it is operated at, size of pond, and water parameters of the water feature). This package comes complete with electronic control panel, outdoor-rated transformer, flow chamber, probe, 2-inch PVC slip fittings, and universal barbed hosetail fittings (1-, 1-1/4-, 1-1/2-inch). It's backed by a 3-year limited warranty. Aquascape is passionate about the products we produce, providing unique products, designs, and features that stand above the competition.